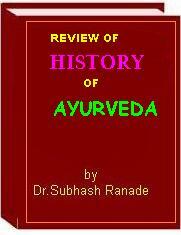 For students of Ayurveda and all enthusiastic readers, it is very important to read this History of Ayurveda, so that they can understand how the science progressed from time immemorial to the present day. History of AyurvedaIt is noteworthy that when the entire civilizations in the world were not progressed much, the Vedic culture and the art of healing or Ayurveda has made its progress. You will also learn how other healing systems in the world have taken some important views from Ayurveda. Prof.Dr.Subhash Ranade Dr. Ranade is Ex. Prof. And Head, Dept. of Ayurveda, Pune University and Ex. Principal of Ashtang Ayurveda College, Pune, India. and is internationally known Ayurvedic academician and physician. He is visiting Professor at various Institutes in Europe, United States, Canada and Japan and has written more than 70 books on different Ayurvedic subjects which have been published in Marathi, English, Italian, German, Polish, Hindi and Malayalam. This great work is very useful for patients, students, practitioners, researchers and for all of you, who are interested in Ayurvedic Science. Don't miss this unique opportunity. Order Today!